Wholesome & perfect soup for a quick lunch. In one pan, melt more than 1 tsp butter, add onion,carrot,half of capsicum. stir fry it for 5 min. Now add corn kernel & simmer it for 10 min.remove from fire, let it cool, then finely blend it from blender. Take another small pan,melt remaining butter,add remaining capsicum & corn , stir fry it for 5 min. Heat a large pan,pour all blended mixture in it,add 3-4 cup water(depend upon the desire thickness of soup) & let it simmer for 10 min,before remove it from fire add fried capsicum & corn, cook it futher only a minute & serve it. Hi Kirti, going to try the recipe right now. Quick question- what is the green ingredient in your picture? Is it coriander garnish? For all comments below: corn kernel is nothing but the corn alone (removed from its cob). Here in US we get it pre-removed and frozen. hello Kirti...can u jus tel me wat is corn kernel as soon as possible plz..? hello kirti What is corn kernel that you used for garnishing? What will happen if we don't use it? 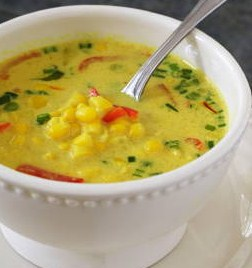 Hi Kirti, your recipe looks great and thanks for submitting nice recipes.Can you please tell me what is Corn Kernel?